The number of technical divers discovering the wonders of the Egyptian Red Sea is on the steady increase with the availability of support now for both open and closed circuit divers. The numerous deep reefs around Hurghada, Sharm and Dahab provide a multitude of sites for visiting ‘tekkies’, but it is nearly always the wrecks which get the adrenaline of a deep diver pumping. Around the daily diving area of Hurghada there are 5 well known wrecks from 32-110m, not including those at Abu Nuhas reef, to offer a dive for all technical abilities, but a lesser known, and by far the biggest wreck in Hurghada, has just been located and dived by the team from Tekstreme Diving at Emperor Divers. The ship is that of the ferry, Al Qamar Al Saudi Al Misri which translates as ‘The Saudi Egyptian Moon’ and lies in a depth of 83 metres rising to 64 at the shallowest point so providing a superb trimix dive just one and a half hour’s sailing from the main port of Hurghada. Launched in 1970 as the Trekroner, the vessel was 124.85 metres in length with a beam of 19.31 metres and a gross tonnage of 7697. 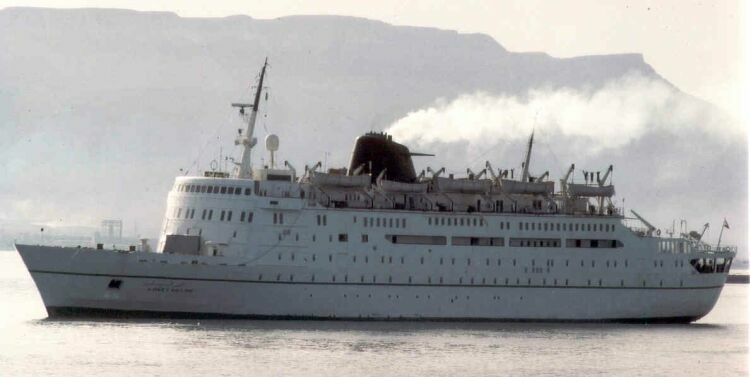 It changed its name in 1971 to the Dana Corona when it moved from Copenhagen to the Mediterranean, and then in 1979 changed again to the Dana Sirena. Finally in 1983 it made the move to Egypt when it was bought by the Al Sabah Maritime Services Co. Ltd. of Jeddah who renamed it the Al Qamar Al Saudi II, then in 1988 it made it’s final move to Alexandria to the Khaled Ali Fouda shipping company who named it the Al Qamar Al Saudi and then one year later changed it again to the Al Qamar Al Saudi Al Misri. It was a very large roll-on roll-off ferry capable of carrying up to 718 passengers and 120 cars at speeds of up to 21 knots and in its final days was used on the route between the ports of Suez in Egypt and Jeddah in Saudi Arabia. 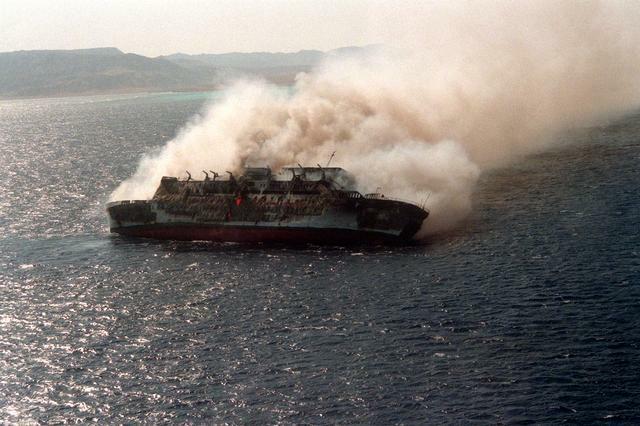 The ship was on a return journey from Jeddah back up to Suez carrying 527 passengers and a crew of 63 when late in the night of the 18th May 1994 a boiler explosion was reported to have caused an oil leak and fire in the engine room which then spread to the rest of the vessel. Various offshore vessels and navy ships responded to the mayday call from the ferry over the radio as people began jumping into the sea and launching the lifeboats to escape the rapidly spreading flames.One of the closest rescue vessels was only 25 miles away when the distress call came. The American destroyer, USS Briscoe, on its second Northern Red Sea deployment was captained by Cmdr. Andrew J. Pitts and he was quick to get to the scene of the disaster and launch his ship’s helicopter to begin pulling people from the burning ferry and out of the sea. Following numerous stories of daring rescues and individual moments of heroism, 15 crew members of the Briscoe were awarded the Navy/Marine Corps Medal.The Al Qamar Al Saudi Al Misri eventually sank the following morning on the 19th May 1994 with 8 confirmed dead, 13 missing and over 50 people injured. 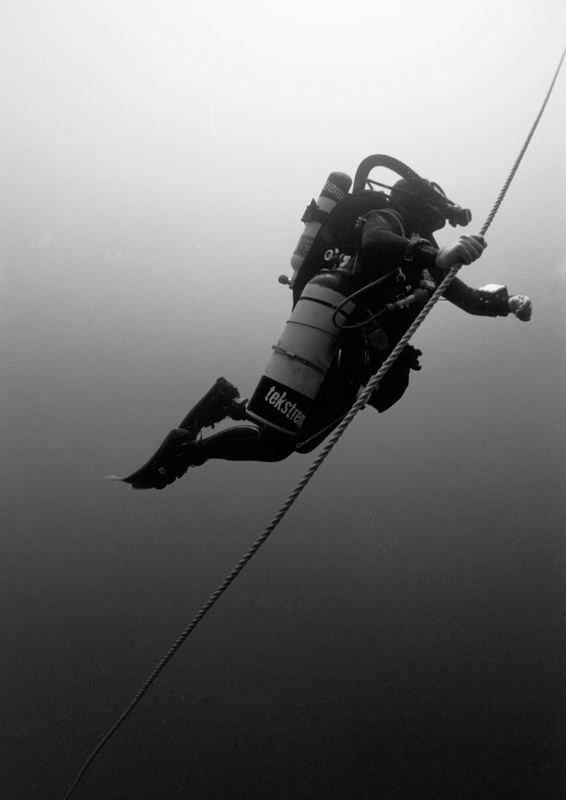 With the popularity of technical diving in the Egyptian Red Sea on the rapid increase, there are always people trying to locate new sites, in particular wrecks, to provide greater attractions to the area. When Aaron Bruce, Tekstreme manager in Sharm el Sheikh passed me some information about a ferry close to Hurghada including a ship’s name, the hunt was on! I spent some time researching the vessel, including obtaining the ships plans so as to provide as much background as possible before actually looking for its location. From the information we had and talking with various boat crews and captains, we had an area to search in no time and everybody we talked to knew the name Al Qamar Al Saudi and so we were very positive about locating the wreck given enough time. Although an initial search proved fruitless, we were not disheartened, and on returning close to the original search area with some new information, it was only just under 3 hours of running a search pattern before a large shape appeared on the echo sounder which, up till then had been showing a flat sandy bottom of between 78 and 83 metres. There was no doubt about it – we had found a very large wreck!Several more runs over the site to plot dimensions and depths revealed an object over 100 metres in length and rising from the 83 metre seabed to a minimum depth of 64 metres. The smiles and excitement on the boat were becoming infectious! The following morning, with spirits running high, we returned to the location of the wreck. With our two KISS closed circuit rebreather units prepared the night before and carrying a trimix diluent along with two open circuit emergency bailout tanks each, we were ready for an exploration of the site. A shot line was dropped next to the wreck on to the seabed and we began our descent. As we descended, the visibility reduced quite quickly and we thought we were in for a disappointing dive, but by the time we reached 60 metres, it cleared up again and we could clearly see the stern of the wreck, lying on its starboard side, appearing out of the gloom. After reaching the clear sandy seabed, the ambient light gave us the most amazing view of the stern with its twin propellers towering above us. We took a moment to compose ourselves and attach a line from the shot to the wreck for our return, and then began our exploration.It was at this point that the value of having, and studying, the deck plans prior to the dive proved to be invaluable, especially with such depths limiting available bottom time. As we swam round to the aft deck the swimming pool came into view and beyond it the entrance into the restaurant and bar areas. Due to the cause of the sinking we had no plans to conduct any serious penetration on this dive with the idea more to get information on the state of the wreck and its condition in the water following the explosion, fire and 13 years of submersion in order to pave the way for future explorations. The damage to the superstructure became more and more evident the closer we got to the midships area where the engine room was situated. The very uppermost level of the ship had fallen off the vessel on to the seabed, as had the main part of the funnel, presumably from the intense fire weakening the structure to a point where it could no longer support itself as the ship rolled on to its side and hit the seabed. As a result of the explosion, access could be easily gained into the engine room area through the deck where it had been ripped apart. 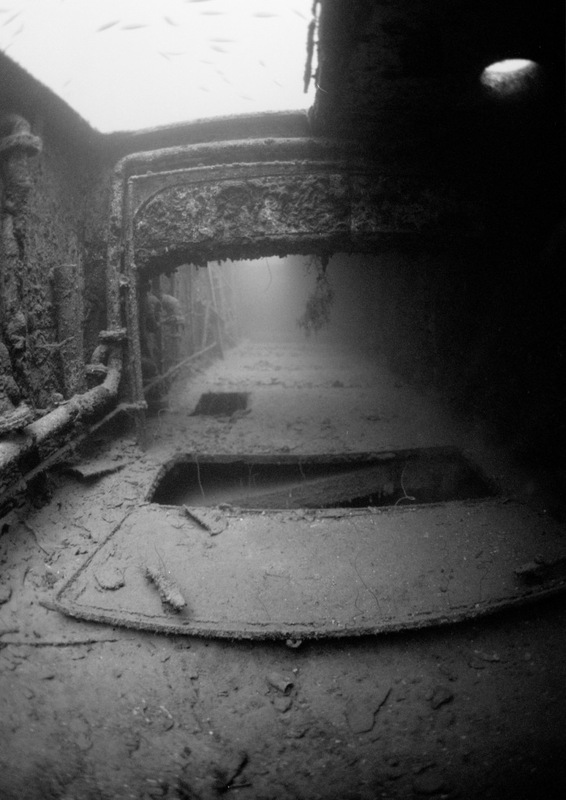 Looking down to the seabed, a single lifeboat could be seen crushed under part of the wreckage, but apart from that all the lifeboat davits around the wreck were empty testifying to the fact that so many people escaped the sinking without injury. As we came to the bridge section, the top level containing the control station was also lying on the seabed next to the main vessel, but the lounge and bar situated at the front of the second deck to offer passengers a view over the bows was still intact with the seating. A compass binnacle was still in place on the port side bridge wing surrounded by a multitude of fish life. Across the bow deck the foredeck hatch was fully open, a curious thing which was also seen in an image of the Al Qamar Al Saudi I obtained from when it was still afloat. A huge spare propeller was still lashed to the port side deck and it was from here that we ascended up to the port side hull to begin the long swim back towards the stern. All over the wreck, fan corals & fish life could be found with shoals of big eyes and the occasional grouper lurking in the shadows looking on at the unexpected intrusion of their home. The coral growth covered most of the outer surfaces of the wreck with the majority of the railings and superstructure having become inhabited in some way and small fan corals adorning the upper side of the hull.As we swam along the shallowest side of the wreck, it gave us a real idea of the enormity of the vessel with the hull seeming to stretch on forever in all directions. Ropes still holding the block and tackle lay across the hull from the deployment of the port side lifeboats, and looking down into the ship through the various doorways & portholes, everything still seemed more or less completely intact, barring some obvious signs of fire damage. Returning to the stern, any doubt of the wrecks identity was instantly dispelled as the raised lettering could clearly be read announcing the ships name in both English and Arabic. Then it was a chance for one last look at the propellers and rudders before returning to the shot line and that long ascent back to the surface. After a relatively short 25 minutes spent on the wreck, we managed to get away with only 75 minutes of decompression and ascent time, a fact which was made only made possible due to the big advantages of the closed circuit rebreather on such dives. It did, however, give us time to reflect on the dive as we crept up the line, with both Aaron and myself smiling away and thinking about our return to the wreck – the next time with a camera and a plan to fully explore the wreck, but not forgetting the fact that there were fatalities during the sinking. Less than a week later, we were returning to the site with the rest of the Tekstreme team from Hurghada and Sharm and, armed with cameras; we were trying to document and gather as much information about the wreck as possible in its current state. 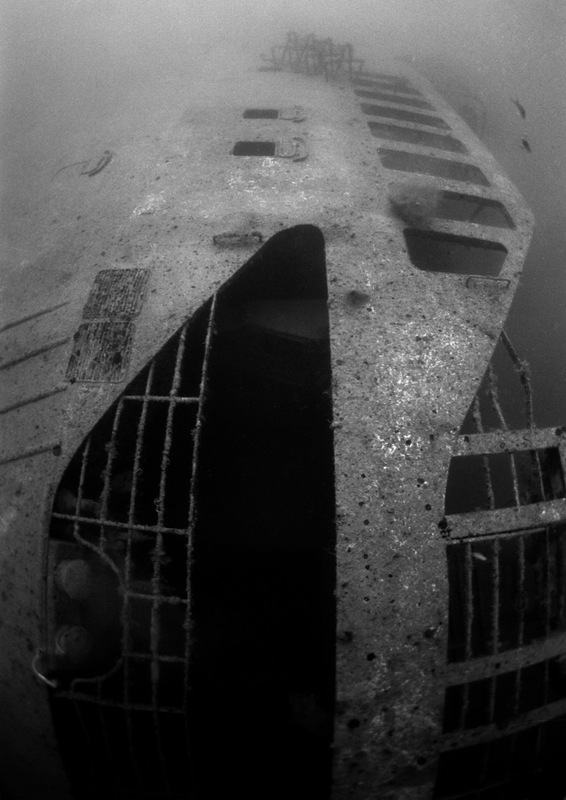 We managed to take images of most of the wreck, but as we quickly found out, even with six divers working together, a wreck of this size and in this depth of water requires several dives to explore it in its entirety. So as Hurghada increased its number of wrecks available to the visiting technical diver by one, the search was already being planned by the Tekstreme Team for at least two more deep wrecks in the area.The Hurghada region really is a wreck diver’s heaven with rusting metal at all diveable depths and in some of the best diving conditions in the world.